With severe bone loss an Autograft can be performed to prepare the bone for dental implant placement. In this particular example a piece of bone is removed from the back of the lower jaw and placed in the front of the upper jaw where a tooth has been missing for a long time. This movie shows the delicate surgery to achieve ideal results. In this situation the area is grafted with using an Allograft, meaning bone not from the patient. This technique eliminates the need for a second surgical site and makes the surgical procedure much less invasive. There are situations where during the extraction process bone is removed and there is a severe defect in the bone. If the area is not grafted at the time of extraction there may be severe consequences. 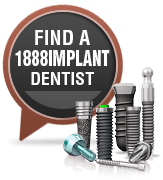 The area will then require extensive bone grafting to rehabilitate the area for implant placement .